When they were building Scotland, I reckon the Master Cartographer got the horizontal scale wrong; the vertical scale is fine, quite a lot like Wales really, but the bits that link the up and the down and the down and the up just seem to go on forever! The Coffin Road was no exception; I left Andy behind while I picked my way across the undulating top of the hill. I’d just spent an hour pushing my bike to the top, yet it took another hour to fight across the “flat” and back down the other side. Alan was nowhere to be seen. 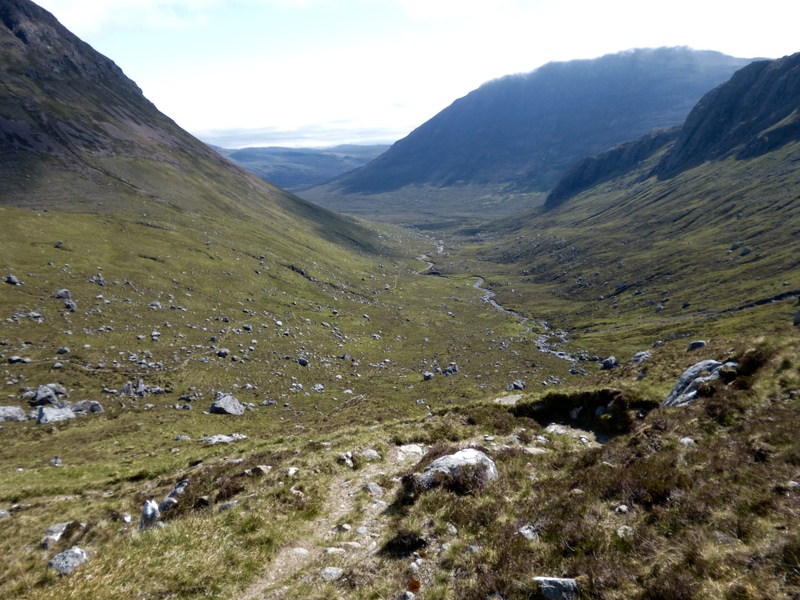 After another 40 mins of climbing and I’d reached the “gate” to Fisherfield. 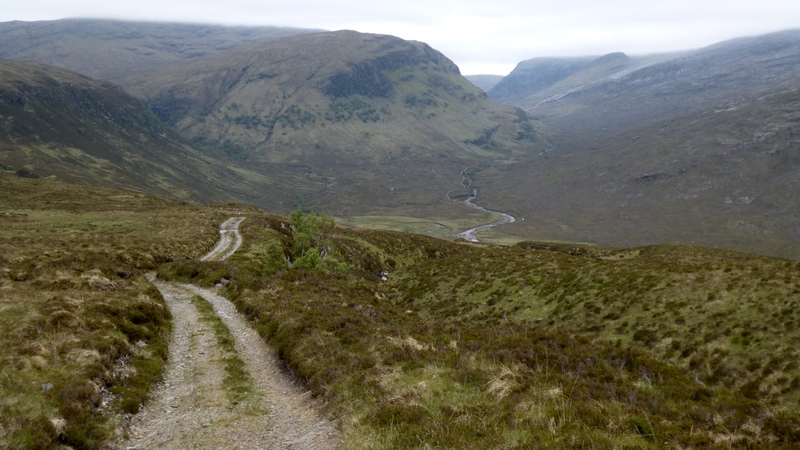 Here, the old route broke off to the right, but this time we would dive down the stone track into the valley bottom and take the singletrack upstream, via Shenavall Bothy to Loch na Sealga. I cruised down the double track to where it ended and continued on the thin technical line of singletrack that followed. I was getting into my rhythm now and, having nailed Glen Canisp yesterday, was feeling fantastic today. The bike seemed to float over most things I pointed it at, and with comparatively little effort. Such a contrast to how I felt the day before. 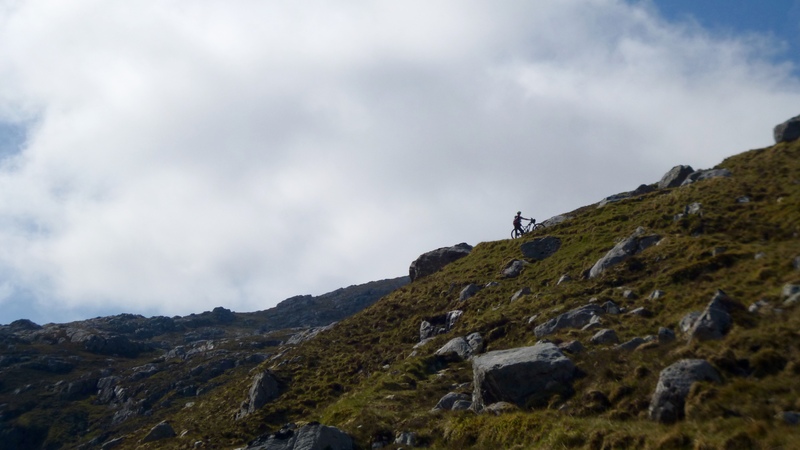 The track turned up hill towards Shenevall, and I could just see a rider leaving. I arrived to find Alan’s bike still there, and he was inside just finishing a pan of noodles. I sat down to take on a bit of food, and with not much else to tend to gear-wise, found myself leaving at the same time as Alan. 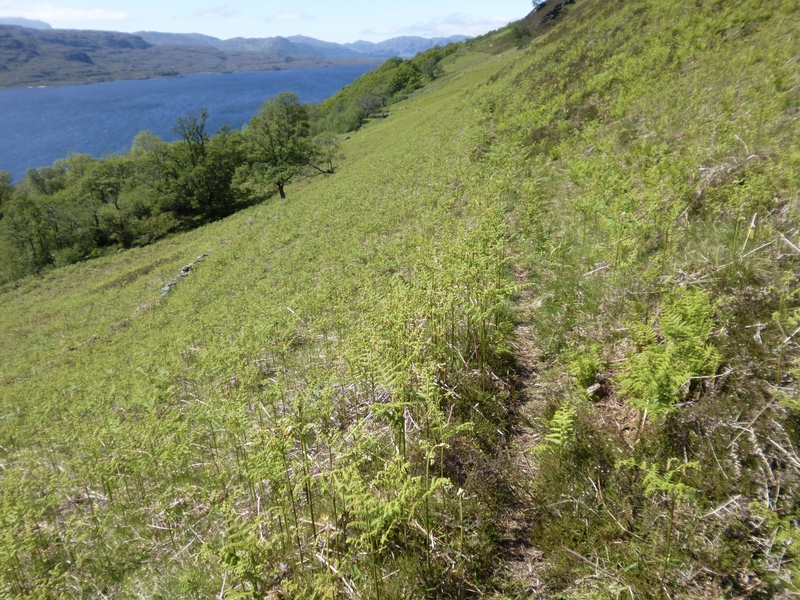 We continued along more techy singletrack towards the loch, eventually turning left to follow the shoreline to the designated crossing place. 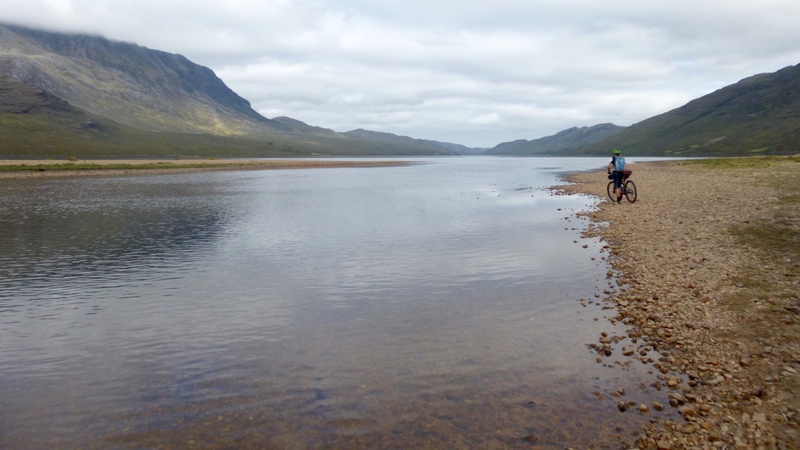 The loch crossing was the lowest I’d ever seen it, barely coming up to knee level. Alan egged me on to ride it. So I did. I got damp feet, but most certainly less wet than if I’d paddled through. It was nice to see the crossing in the daylight, as it doesn’t half look intimidating in the full dark when your light barely illuminates the far bank. 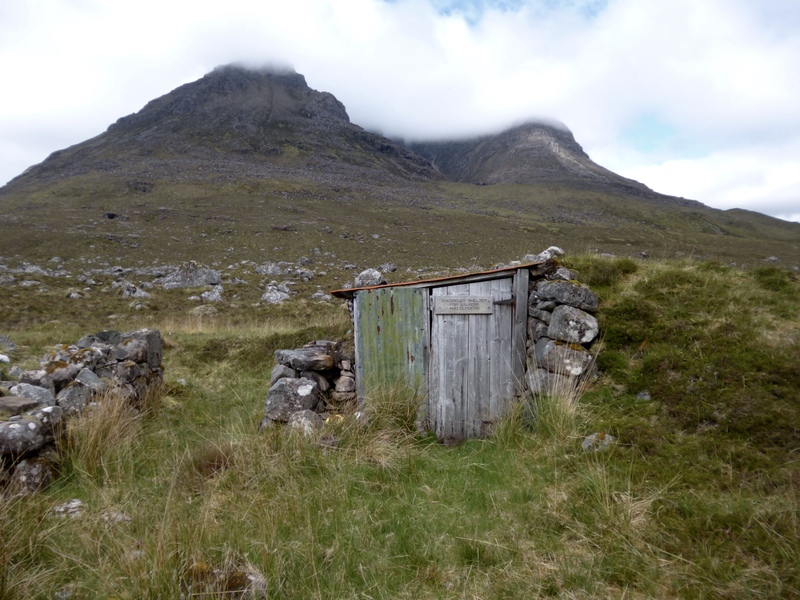 Just after the crossing we came to the shooting hut of Larachantivore, and I searched out the emergency shelter that I found by chance, and used, in 2013. The cloud was starting to lift off the summits now, and it was looking like it would be another hot day. I pursued Alan up the valley, eventually getting the better of him where the 29+ wheel rolled over the rocks more easily. 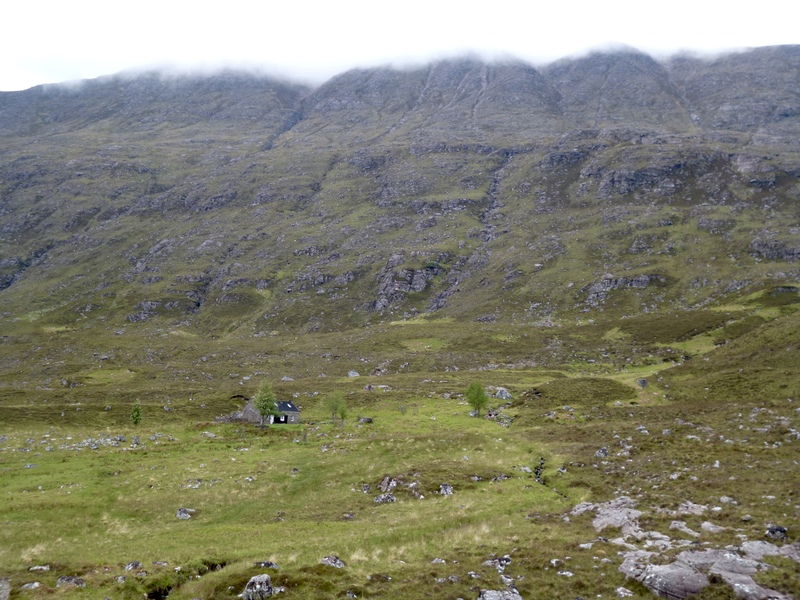 The scale of Fisherfield is deceiving. You can see all the summits around you, but there’s little sense of scale. The reality is that you’re a very small object in the bottom of the confluence of two very large valleys, and the head of the valley you can see as your exit is more than an hour away. With the sun out, things hot up and Alan eases past me while I adjust my layers, and peel off my arm warmers. The riding comes to an end and we’re faced with the push out onto the top of the plateau. Alan makes a finer job of this than I, but I am distracted by the majesty of the place and linger to capture more photos. This is why I’m here really. I’ve done the sharp end of things, and it’s fun in its only unique and painful way, but right now I wanted to soak up this experience. Finally the pushing ends, and amidst the cloudless summits I stand for a moment in awe. In 2013, the cloud was down and I never saw the full extent of Fisherfield. This was a moment to savour; I may not ever experience conditions this good here ever again. I made the transition along the top, again predictably under-estimating how long this would take, before the descent down to Ffion Loch. The opening part of the descent is fairly straight forward, a wide walking path, punctuated with waterbars, that dived down into the next valley. I thought of Gian and how he had this to look forward to, and still wished I had an ounce of his skill to aid my descent. After the Suprise View, things got more technical, but I rode virtually all of it with confidence. 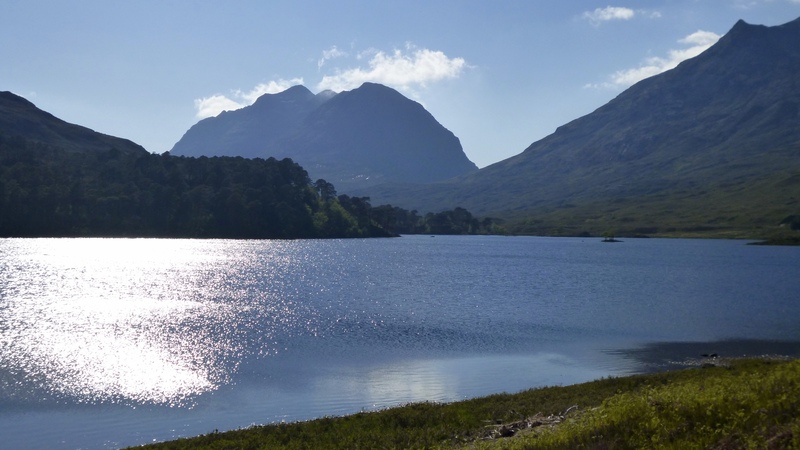 It was midday as I crossed the causeway and embarked on my exit to Fisherfield. 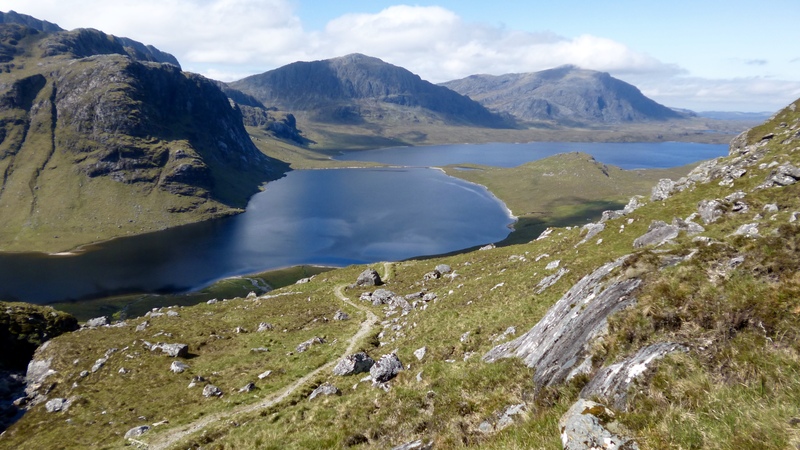 This year would be via a new route called the Postman’s Path; a historic route where the postman would bring mail once a month from Letterewe to the lodge beyond the causeway. The opening section was really quite rideable, and it wasn’t long before I was over the top and embarking on the fast and twisting descent to Letterewe. 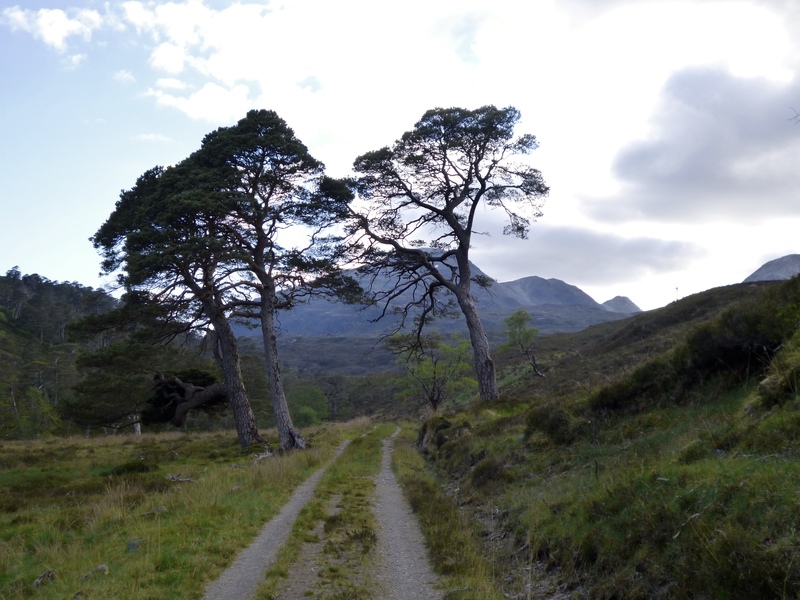 The estate here is only accessible by boat now, since the water level in Loch Maree has changed, and consequently the route to Kinlochewe, at the end of Loch Maree, traces a line further up the hillside. 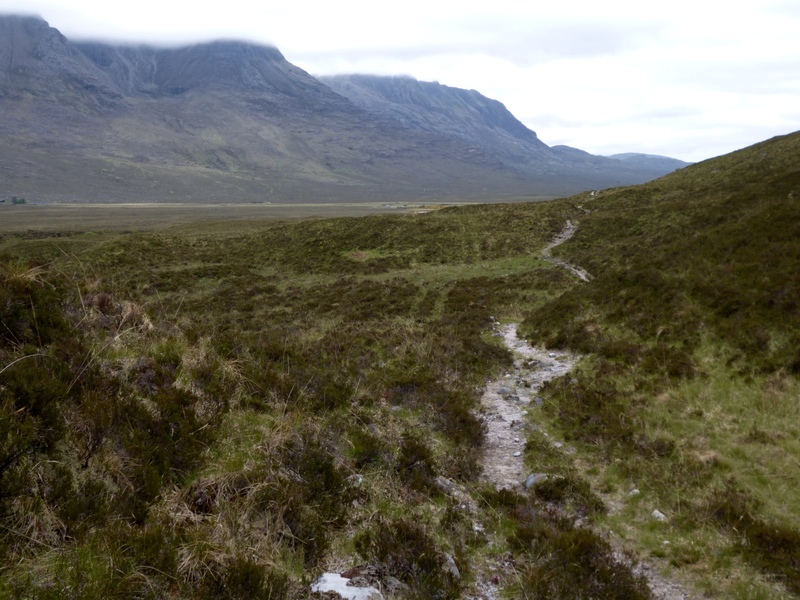 From Letterewe, the trail was marked with a footpath sign. They weren’t kidding. The trail was super-narrow. At times the track was barely wider than my 3″ front tyre, clinging to the hillside and intently following its contours with precision. I was loving this. It was a real buzz to be riding something so marginal, so little room for error. If for a second I’d thought about the trail too hard, or just how good the handling of the bike felt, it would all have started to unravel. I stayed relaxed and went with the flow. I was in that place where bike and rider were one it all felt effortless. It was pushing on through the afternoon now. I reckoned I’d make the Whistle Stop Cafe by about 3:30pm. I could even see the end of the loch, and even allowing for it being further than it looked, I was still quite confident. And then it happened. The bubble I was in burst. The sinuous line of dirt through the bracken evaporated. Before me lay a jumble of rocks and heather. No amount of technical finesse or being-at-one-with-the-bike was going to get me over this lot. I picked my way through one step at a time, legs getting scratched by the vegetation or ankles bumped against rocks. 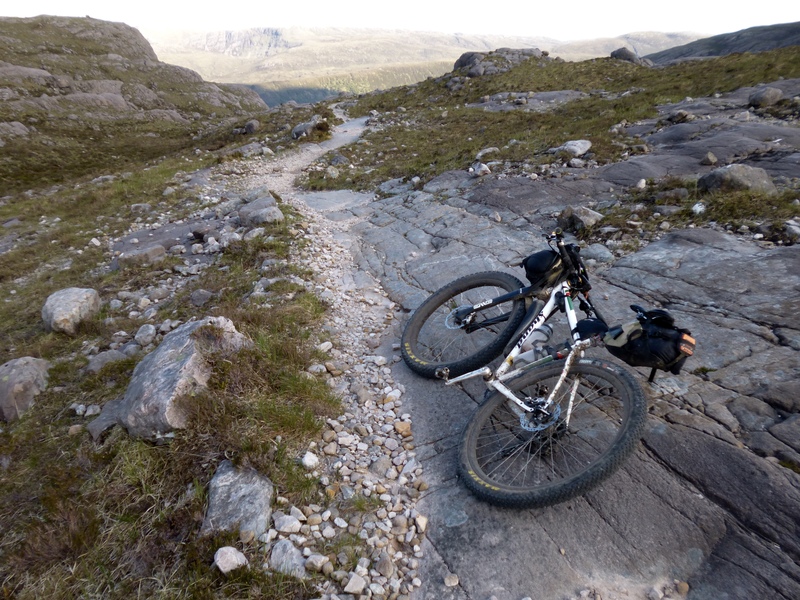 Unceremoniously, the bike clattered over the rocks alongside me. On and on it went. At times I could see long stretches ahead, and I expected to see Alan ahead, but there was no sign of him or any improvement in the trail. It grew frustrating. Time seemed to tick away at an alarming rate while the kilometers passed by painstakingly. I arrived at the Whistle Stop Cafe at about 4:15pm. Thankfully, they were still open, as I was tired and hungry. 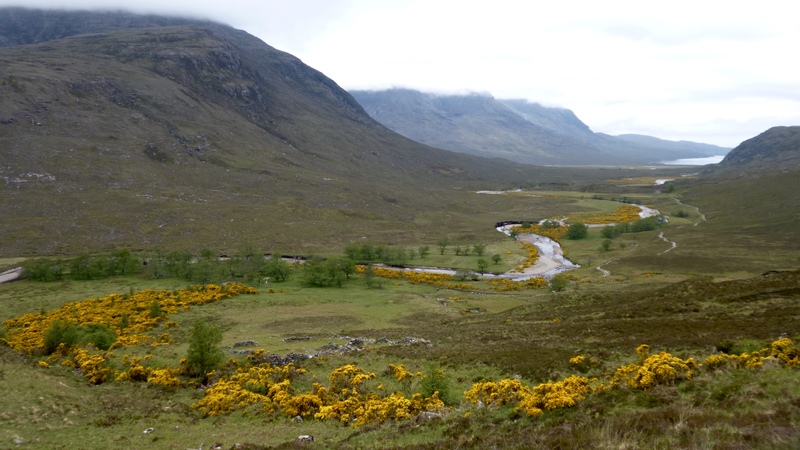 The whole crossing from Dundonnell to Kinlochewe had taken me 8.5 hours; a distance of only 50 km. Bryan Singleton was there, and Alan too. They’d ordered food, but it hadn’t arrived yet, so I wasn’t that far behind them all along. I have to say that I was less than complimentary about that last section. Alan took it very well, and suggested I sleep on it. It took a few nights of sleeping on it, but I figure he’s right. 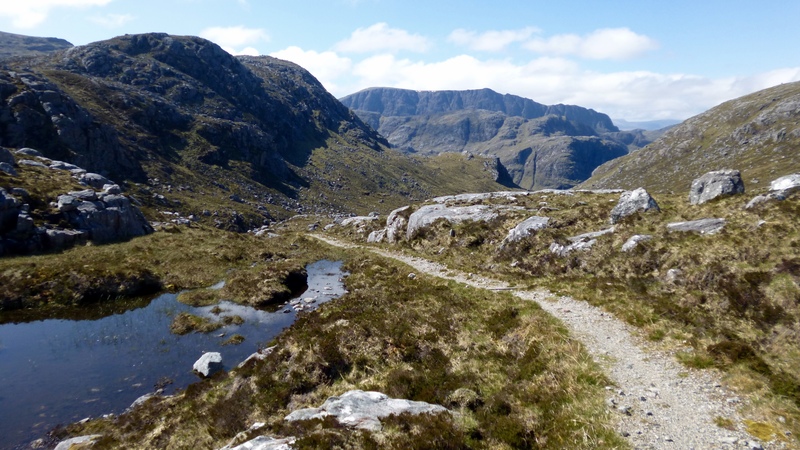 The technical difficulties and frustrations of the last part amounted to only a few km’s, and it was but a small price to pay for the passage through Fisherfield. 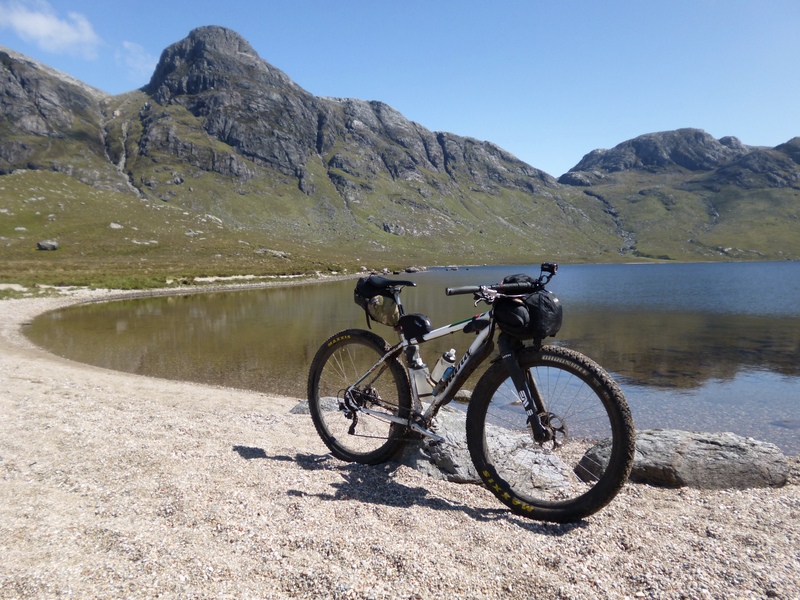 Alan and Bryan left while I faffed about with bottles, chamois creme, this, and that, before I rode down the road towards Torridon. Speaking with Steve Heading a couple of days before, (who later scratched at Achfary with a mechanical), he reckoned it would be 5 hours quicker than the previous route. “It’s all easy fireroad”, he said. This happened to be one bit of the route that I hadn’t paid particular attention to, but my mind had latched onto Steve’s words as I made my way down the valley and began the climb up into the forest. 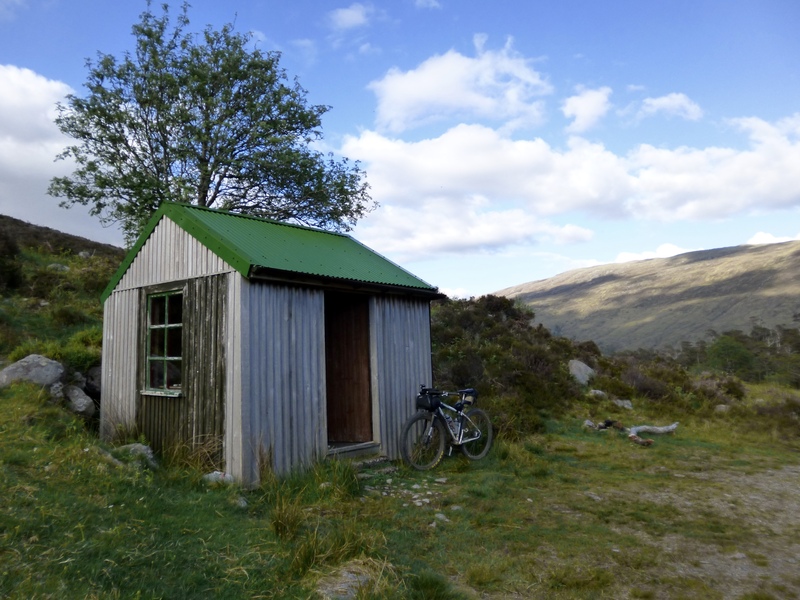 The fireroad pretty much ended at what is known as the Tea House Bothy. A nice little spot, and I lingered for a few moments and looked inside. 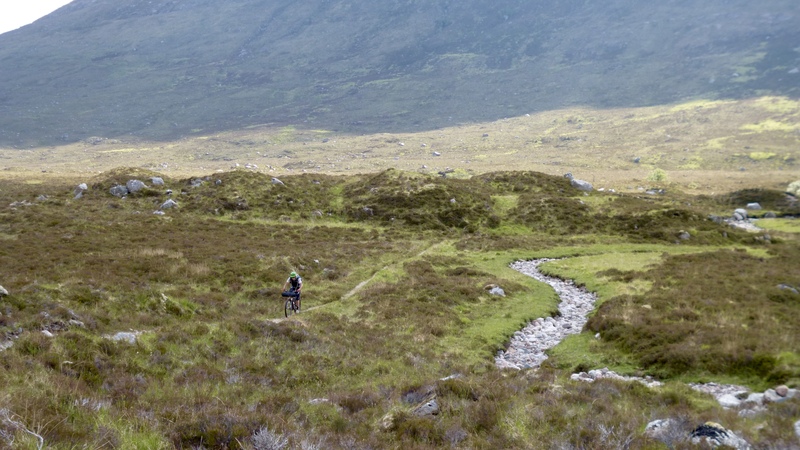 After the bothy the trail reverted to singletrack. I’d struggled to get going after the Whistle Stop, and on a good day, I would no doubt have enjoyed this trail. 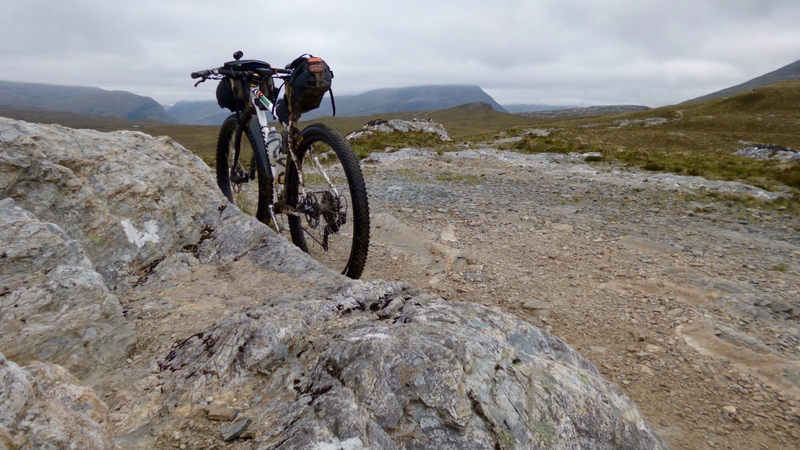 As it was, my technical ability seemed to have evaporated and I struggled all the way to the top – on and off the bike sometimes for the most benign of obstacles. It became another one of those trails that, after you’ve done the initial climb, it seemed to grab hold of you and go on for ever. The decent came eventually; a technical rock-fest of drops, slabs, tight turns and chutes. The large wheel seemed adequate compensation for my lack of skill. On any other day I would surely have loved every minute of this. But not today. Just let me get to the bottom, preferably in one piece. 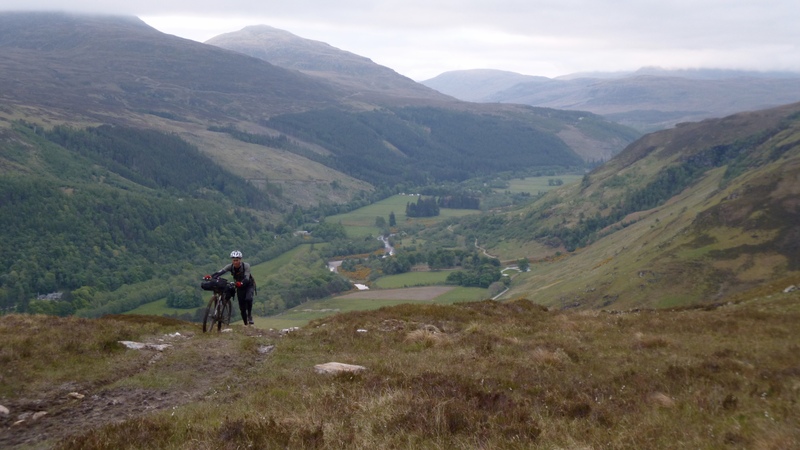 I rolled into Strathcarron around 9pm, restocked with some simple food and began the section through Attadale and Glen Ling to Dornie. I remember Glen Ling has a habit of going on a bit; another of those glens that does its best to hold onto you, but on this occasion I found it OK. The roll down the road to Dornie was a place where I struggled with staying awake in 2013, but I was feeling better this time around. This was also the section of road where the mysterious phone box appeared, and the spots of tar on the road appeared to scatter as I went over them. I was largely free of hallucinations this time around, but to pass the time I tried to re-imagine the shapes of the repair patches on the road as other things; a hamster with a rocket launcher being the most notable. The sky overhead was crystal clear, and the valley down to Dornie was cold. I could see the sea mist was starting to roll in, which would have made for an uncomfortable bivvy. I coasted through town, and began the climb out again to get above the cold air. 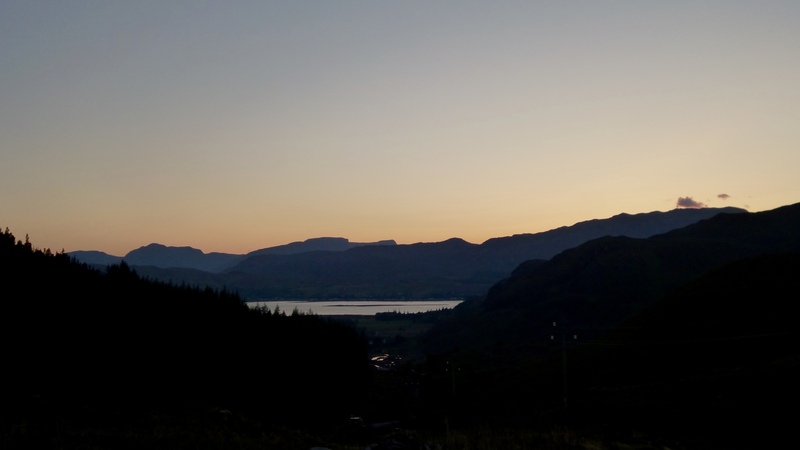 I didn’t have the legs to tackle the Glen Lichd ascent to Camban tonight, and decided my day would be done by Carr Brae Viewpoint. If I’d judged this correctly, I should be above the clouds in the morning. It was 12:45 am. That was one long day. Hi Ian, the link to part three doesn’t get me to the eagerly awaited part three, any suggestions? It should be working now Andrew. Enjoyed that very much Ian, good writing and superbly clear pictures. 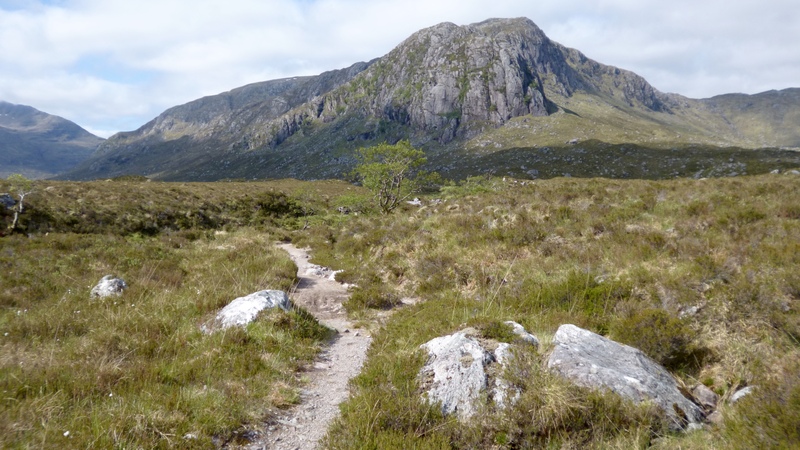 I had set off May 23rd, but it was the postie path section that finished me off… Too tired to risk riding most of it, hot sun, flies, and the awkward walking where you can’t place your feet (my left foot) firmly on the ground meant my old fractured heel injury was causing problems. Then the ravine with the tree ! I muttered several times ‘if this is bike packing you can stuff it’, and was cursing Alan. By Kinlochewe I had decided ( and that was 8:15pm) I’m out. Besides the foot I had Achilles’ tendon problems, extreme saddle sore chafing, and a sore neck probably through pushing on the right hand side (I find it difficult pushing on the other side). But I had to do 75 miles to get back to Fort Bill and a train.